Where oh where is my Uncle Charlie when I need him?!?!?!? I STILL don’t like doing science fair projects. And the worst part is, I am not sure how much of it I should be doing and how much of it I (and by I, I mean my obsessive, perfectionist self) should let the second grader do by herself. 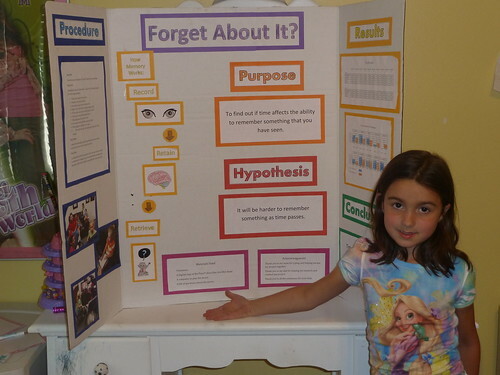 For the past two years, Isabelle hasn’t even brought up doing science fair projects (as they are not required at this age) so we have been lucky until now. When she brought it up I tried to talk her out of it, but her daddy said, “I’ll help her, she can do one.” Then he went into the hospital and had about fifty other things come up. So after changing what she was going to do her project on three or four different times, we finally settled on seeing how much time affects your ability to correctly recall information. Isabelle learned about how the brain stores recalls memories. She showed a group of people a video, gave a test to half of the people immediately, and then gave the test to the other half the next day. Here was her finished project. Great Project! Looks like some hard work went into this..tell her how great it looks for us!